Internet Explorer (IE) is the suggested web browser. To download the latest version of IE, visit the Microsoft IE download page. To use Moodle, your web browser must have cookies enabled. Google resource on how to enable cookies in your web browser. If you cannot open files that your faculty has placed on your course site, you may need install or update a plugin. The list below will take you to the sites to download the free plugins that you need. Download a free PowerPoint Viewer – to read .ppt or .pptx files. Download a free Microsoft Word Viewer – to read .doc files. Also, download and install the Compatibility Pack from this site to read .docx files. Download a free Adobe Acrobat Reader – to open .pdf files. Download a free QuickTime Player – to play file formats: AIFF, WAV, MOV, MP4 (AAC only), CAF and AAC/ADTS, and others. Download a free virus protection package: AVG. Download Spybot Search and Destroy. Detects and removes different kinds of spyware from your computer. Download a free Microsoft Excel Viewer – to read .xls files. Download a free Windows Media Player. Download a free Flash Player – to view Flash media. Download a free RealPlayer – to view web video. Papercut is the print management system used by South College for library, computer lab, and personal laptop printing and photocopying. The Papercut software allows students to view their print/copy account balance, add money to their account, view their printing and photocopying history, and request refunds. Students add money to their account by following the directions in this Print Account Management PDF. Students who would like to request a refund should do so through their Papercut account. 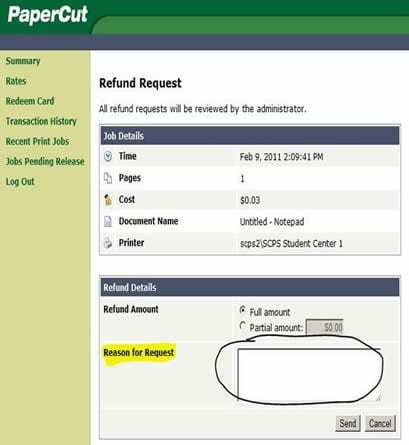 To request a refund, the student should log in to their print/copy account using their Student Portal login and password. Find the print job in question and click “Request Refund” in the right-hand column. Enter the requested refund amount (full or partial) and a detailed explanation of why the refund is requested. Refund requests are reviewed regularly by the IT department and approved or denied on a case-by-case basis. Web Printing allows students to upload documents from a web browser and print to any of the student printers located on either campus. Please see the instructions below for a detailed step-by-step guide. iPad printing is now available at the South College Parkside campus. Please see the instructions below for a detailed step-by-step guide. Below are the answers to common helpdesk questions. Q: HELP! The Classroom PC will not let me log-in! You are allowed 3 unsuccessful log-in attempts before your account will be locked out. If your account gets locked, you will have to wait 20 minutes before you can attempt to login again. If you need your password re-set, please send an email to support@south.edu requesting that your password be re-set. Q: How do I change my South College Network Password? Q: How do I change my South College E-mail Password?